"So, did you see Watchmen yet?" "I did it 35 minutes ago." § March 6th, 2009 § Filed under Uncategorized Comments Off on "So, did you see Watchmen yet?" "I did it 35 minutes ago." 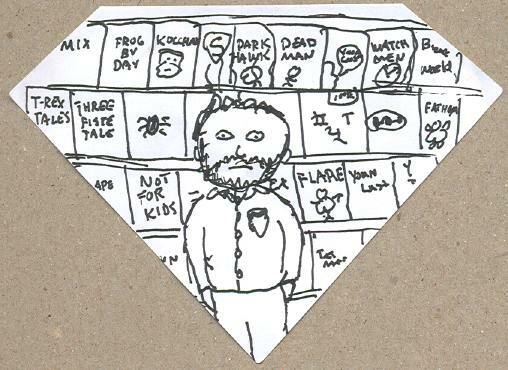 Customer Jim has a new column up over at Comics Bulletin, in which he discusses his most recent visit to our shop and his perusal of our bargain bins. He mentions that he was saddened a bit by the discovery of an issue of the recent Spirit series in there. I thought I’d use Jim’s nice article as a springboard for some bargain bin discussion here. Well, the vast majority of comics that are in our bargain boxes come from collections acquired at the shop. Specifically, they’re the parts of collections that are basically “thrown in” with the stuff we’re actually interested in buying, and thus not anything into which we have any real money. There’s not really anything wrong with much of this dumped material. They may simply be “mid-grade,” VG copies that are common and not terribly pricey (like those Doctor Strange s Jim mentioned), and thus not in demand by the more condition-conscious collector. Or (or perhaps, in addition) it may be that we’ve already got enough of it in stock, and it’s not worth going through the effort to add more copies into the database and put ’em away in the back. Some of the bargain bin contents come from overstock that we’ve pulled from our own backroom, but a couple of years ago we sold a lot of that bargain bin-destined overstock in a massive bulk stock sale (which some of you may remember reading about on my site here) so we don’t have a whole lot of that any more. Not saying we couldn’t stand to make another pass through the backroom and pull more overstock out, but we’ve got plenty of dumped-collection stock to go through before I do that again. By and large I don’t put a whole lot of very recent material in the bargain bins. Partially because I don’t customers to think “well, crud, I just paid $3.99 for this last month, and here it is for a buck,” and partially because I don’t want people to pass up buying something new on the rack in the hopes of getting it out of the bargain box a couple of months later. In other words, when issues come off the new comics rack, I’m not keeping a couple of each aside to throw in the discount box. But occasionally I’ll dump a recent book into those boxes, maybe to encourage someone to try the series out, but mostly because, yes, I didn’t feel like going through the effort to process the book and add it into the backstock, particularly if we’ve got plenty already. This is the case with the Spirit book. It’s not a huge seller, but it’s a consistent seller on the new rack, but with little back issue movement. As such, I don’t have any real incentive to maintain much of a backstock on the title. When we ended up with a couple of extra copies from some collection or ‘nother, into the bargain bins they went. The bargain bin is a useful tool to turn on people to some old, cool comics, or to help us clear out some slower selling items, or to otherwise expose that portion of our customer base that doesn’t usually buy back issues to older comics at an attractive price. Plus, I have plenty of kids who come in with only a buck or two to spend, and the bargain boxes give them some old books to choose from without having to worry about paying high collectible values. If I can put some Curt Swan, Marshall Rogers, or even some Kirby into the hands of those kids, those bins have done their job. And if they take home a few chromium/embossed Turok #1s, even better. The more of those that become Somebody Else’s Problem, the happier I am. I have to admit, I have a lot of customers very excited about the Watchmen movie, with several talking about attending the midnight showing Thursday night/Friday morning. I’m going to get a whole lot of “have you seen it yet”s over the weekend, but that’s okay. I imagine we’re going to see a very strong opening weekend. The second week dropoff will be what I’m interested in seeing. Reviews are middling, but the comic fans I know who have seen it have really liked it, so who knows. Basically, the point of talking about Watchmen here is to justify my using one of my Twitter posts for the subject of this entry. This probably belonged in yesterday’s Swamp Thing linkapalooza, but hey, better late than never: a very familiar-looking plant creature from the 1979 2000 AD annual. I threw a piece of cardboard behind it so you can see that it was drawn on Superman “S”-shield-shaped paper for extra nerdiness. I find the stink lines to be a somewhat unnecessary embellishment. Although I’d totally read Frog by Day .